Sutton Coldfield Marquetry Group are hosting the 67th International Marquetry Exhibition at Middleton Hall & Gardens in May 2019. The exhibition will include up to 200 examples of the very best of contemporary marquetry within the British lsles and it is also open to overseas exhibitors. Visitors will also have the opportunity to try their hand at this skillful craft. Marquetry is the art or craft of making pictures and enriching other articles of wood with decorative designs by the skillful use of the grain, figure and colour of wood veneers. 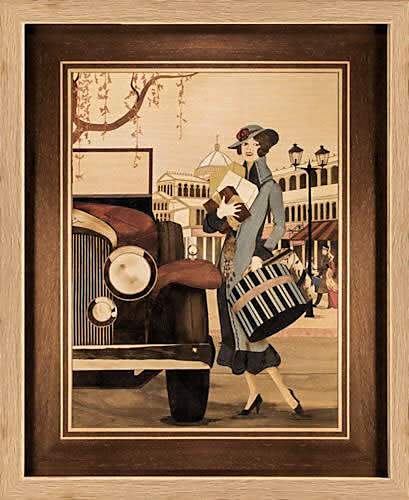 An item of marquetry is built up by inlaying the separate parts of the picture or design into a background wood veneer. The completed item of work is then glued to a prepared base board or background, and the finished surface sanded and finally polished. In addition to the competition entries, you will be able to see marquetry work carried out by Tony Jacklin, the professional golfer, best known in this area for his success as European Ryder Cup captain at the nearby Belfry Golf Course. Jacklin is an avid marquetarian and he has agreed for some of his work to be shown in special display at the exhibition. Saturday 25th May – Thursday 30th May, 10am – 5pm. Last admissions at 3pm. Thursday 30th, exhibition displayed AM only. £6.60 Gift Aid Adult, £6.00 Standard Adult, free for U16s and Middleton Hall & Gardens season pass holders. We encourage visitors to make a £3 donation to park on your arrival, however, this is optional and donations of any size are welcomed. All donations go directly to the Trust to help us maintain and develop the site. Your entrance fee gives you access to the Hall, gardens and grounds between 11am – 4pm. If you fancy a bite to eat or want to visit the shops at The Courtyard at Middleton Hall, you can come in and out as you please, just keep hold of your admission tickets. (Coffee shop open 7 days a week, 9:30am-4:30pm, shops open Wednesday-Sunday, 10am-4pm). We do not offer a ‘Grounds Only’ admission fee. Access to the gardens and grounds is included in your standard admission. Sutton Coldfield Marquetry Group meets in Curdworth Church Hall on the 3rd Thursday of each month. It is a friendly and expanding group and dedicated to encouraging beginners to take up the craft. For further information please contact Mike Roberts: 0121 308 0239.